In the context of contemporary science, we know that a particular domain of inquiry is coming of age once it is subject to brain imaging. Irony aside, in an article published in Neuroimage, Fukui and Murai  report on risk anticipation, making this observation: insensitivity to future consequences, after damage to the human prefrontal cortex, affects the anticipation of risk. Writing these introductory lines to the issue that our Journal dedicates to Anticipation and Risk Assessment, I cannot avoid making the connection to the current economic crisis in the USA (sub-prime mortgages, troubled financial institutions, excess energy consumption, inflation, etc.). The people’s pre-fontal cortex – to use a bit of analogy – (or at least that of the people in power) seems to be damaged. If anything can be said with certainty, the risks involved in less than responsible mortgage lending or speculative futures trading, or hedging do not take anticipation into consideration. Interestingly enough, the year I was born,Willford Isbell King  published “The Causes of Economic Fluctuations: of Anticipation and Control”. In all fairness, King’s book is only of documentary interest for a world that faces risk in ways that no one ever imagined – including risk management as a profitmaking machine. However, during King’s time, there was no scientific focus on anticipation and anticipatory processes. It is only after Robert Rosen dedicated a number of years (starting in 1972), in affiliation with the (in the meanwhile defunct) Center for the Study of Democratic Institutions (Santa Barbara, CA) that the word Anticipation was elevated to what in science is called a concept. 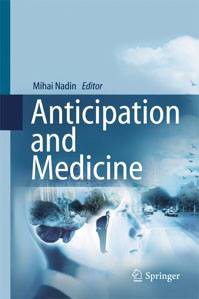 Institute members debated whether anticipation could be of any relevance to society. Parallel to Rosen’s work, my own focus on the human being’s cognitive condition eventually led to a book that suggested a theory, as well as applied aspects of anticipation (cf. [3,4]). But this is no time to reminisce. Professor Alain Bensoussan and Professor Elisabeth Pate Cornell organized an international conference – Decision and Risk Analysis: Convergence Between Finance and Industry (University of Texas at Dallas, 2007). They entrusted me with organizing a session – Anticipation and Risk Assessment – and the results of this session are submitted to the broader scientific community in this issue. My intention in organizing the session was to take a rather difficult subject of inquiry and bring it as close as possible to applications. Let me mention for the record that one of the participants in this session was Jeffrey V. Nickerson (Center for Decision Technologies, Howe School of Technology Management, Stevens Institute of Technology). It was he who, as one of my graduate students many years ago, brought Rosen’s Anticipatory Systems to my attention. In his article (“Anticipation and Sensor Networks”), Nickerson presents an information-science based application intended to mitigate risks associated with enemy intrusions. Lev Goldfarb, together with Ian Scrimger and Reuben Peter-Paul (“ETS as a General Tool for Decision Modeling and Analysis: Planning, Anticipation, and Monitoring”) advances his mathematics, meant to represent processes instead of the usual number-based descriptions of the state of affairs in the world. His understanding of anticipation is rather subtle. The reader will easily find ways to generalize from the example the authors chose (an insider’s view of a terrorist operation) to many possible applications, using an internal view of a generic planning process. The (constant) Fight for Innovation”). My first discussion with Jochen Corts (February 2004, in Wuppertal, Germany) brought up not only my theories of anticipatory systems , but also the possibility of applying them as an underlying component of the knowledgedriven economy. Subsequent meetings allowed me to learn from practitioners in engineering and information science, just as it allowed them to better understand how anticipation-driven solutions improve an enterprise’s competitive edge. They recognized the risk, which many traditional industries face, of remaining captive to a production model that competitors can easily emulate (China does this with spectacular results), and applied anticipation in order to switch from the industrial model to a knowledge economy alternative. from his company and to present the software used for the above-mentioned purpose, never evolved into a text that I could submit to the reader in good faith. But we keep the door open. The risks involved in identifying successful new music (in particular, songs) and in producing a new CD (a major investment that can make or break a label) can be diminished by a good anticipatory evaluation. 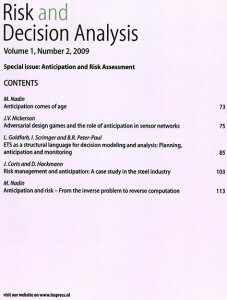 My own contribution (“Anticipation and Risk – From the inverse problem to reverse computation”) might provide an entry point for those without a background in the new field of anticipatory systems. It would be disingenuous to claim that it will be easy reading. 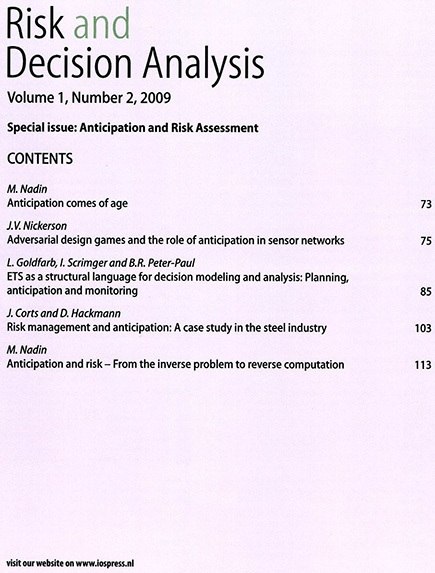 As our Journal matures, more contributions to the tenuous relation between risk assessment and anticipation will probably become available. The current economic mess in which we all find ourselves is probably as good as any argument for encouraging the community of risk-focused scholars to integrate anticipatory considerations in their work. H. Fukui and T. Murai, Functional activity related to risk anticipation during performance of the Iowa Gambling Task, Neuroimage 24(1) (2005), 253–259. W.I. King, The Causes of Economic Fluctuations: Possibilities of Anticipation and Control, Ronald Press Co., New York, 1938. M. Nadin, Mind – Anticipation and Chaos, Milestones in Thought and Discovery, Belser Presse, Stuttgart and Zurich, 1991. R. Rosen, Anticipatory Systems: Philosophical, Mathematical and Methodological Foundations, Pergamon Press, New York, 1985. M. Nadin, Anticipation – The End is Where We Start from, Lars Müller Publishers, Basel, 2003.